I take about a hundred pictures every day, and try to edit and tag them every night, but I don’t always get to them on time. This is one I took back in September, and didn’t really notice until I was looking for a different photo. 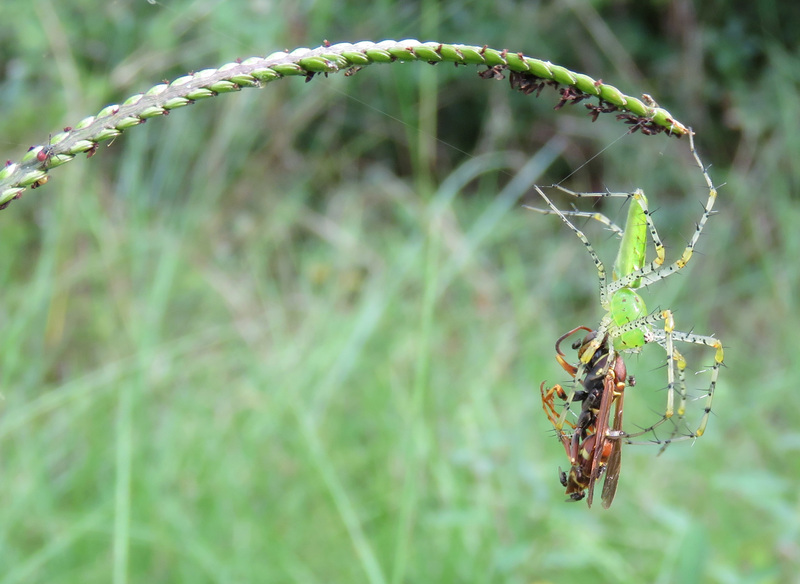 Green Lynx (Peucetia viridens) and Paper Wasp (Polistes exclamans). I know I came across this spider long after the battle had been fought, but I wish I had noticed more at the time. 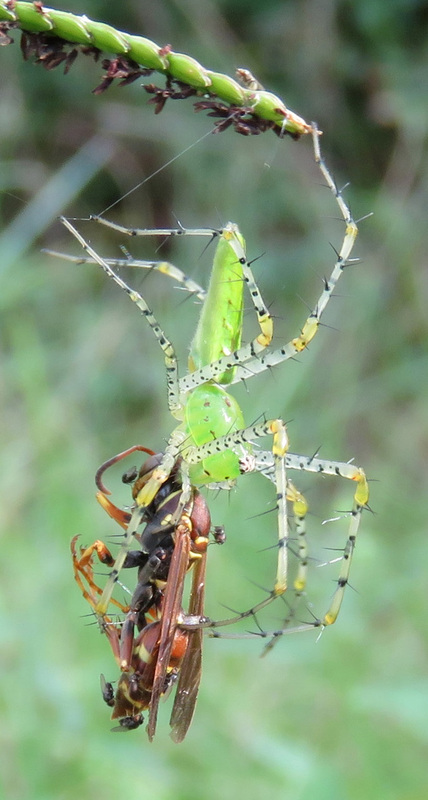 I usually see Green Lynx spiders in the middle of a plant with a sturdy stem and lots of leaves, where they blend in. What was this spider doing on the top of a long stem of grass, so thin that its weight bows the grass over? Did the Paper Wasp happen by, or was it up there and the spider went after it? What are the flies after? Can the spider get back onto the grass stem when it is hanging by only one foot and a thread?!!! Just think of all the life-and-death battles going on around us all the time, that we never even notice. Those are some deep thoughts! It is mind boggling how the spider can hang there only on one leg. The strength that some animals possess is really incredible. Good thing us puny humans have our big Ole brains to get us through!